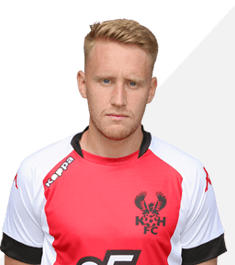 Liam Truslove signed for the Harriers on the verge of the 2016-17 season after appearing in pre-season friendlies a few times as a trialist. He was released by Birmingham City at the end of the previous season and has signed a one year contract with us. While at Blues he had two games on loan at Leamington but that ended early due to a bad injury. He signed a contract extension for us but fell out of favour for a while. He then went out on loan to Rushall Olympic for an initial one month in September 2018.